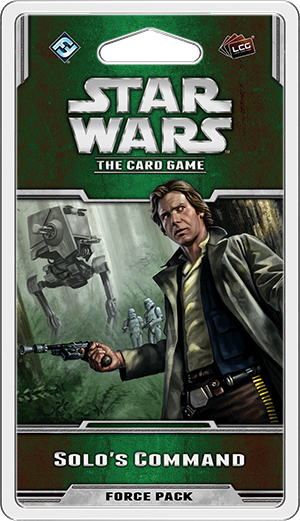 Fantasy Flight Games is proud to announce Solo’s Command, the first Force Pack in the Endor cycle for Star Wars™: The Card Game! 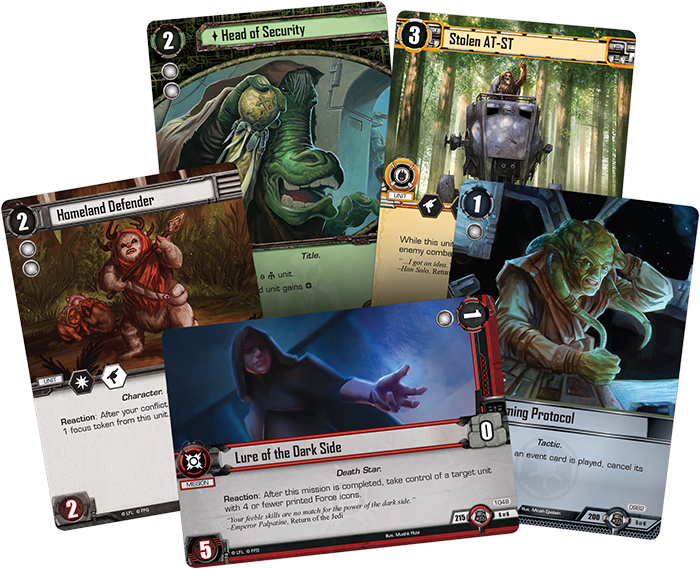 Star Wars: The Card Game focuses on some of the most memorable scenes in Return of the Jedi with the introduction of the Endor cycle. The Empire constructs its second Death Star above the forest moon of Endor, protected by a ground-based shield generator. In response to this devastating threat, the Rebel Alliance plans a two-pronged attack – a small strike team will eliminate the shield generator while the massed power of the Rebel fleet mounts an overwhelming assault to destroy the Death Star. What the Rebel Alliance does not know is that the Emperor has lured them all into a trap. The Imperial fleet is ready for battle, the shield generator is protected by a legion of the Empire’s finest troops, and worst of all, the new Death Star’s superlaser is fully operational. As Han, Luke, Leia, and Chewbacca descend to the surface of Endor to begin their desperate mission, you can relive this epic story and retell it yourself with the packs of the Endor cycle, beginning with Solo’s Command! 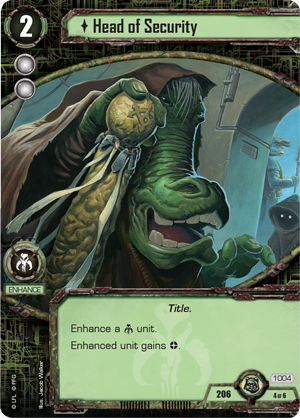 From the beginning of Star Wars: The Card Game, objectives have played a key role for both sides. The light side must destroy three objectives to achieve victory and while the dark side can advance the Death Star dial slowly over time, the dial advances much faster when you destroy objectives. Destroying objectives not only brings you closer to victory, it deprives your opponent of powerful effects that could turn the tide of battle. Still, the objectives you attack are mostly determined by your opponent – he chose which objectives to include in his deck and he chooses the objectives that start in play. 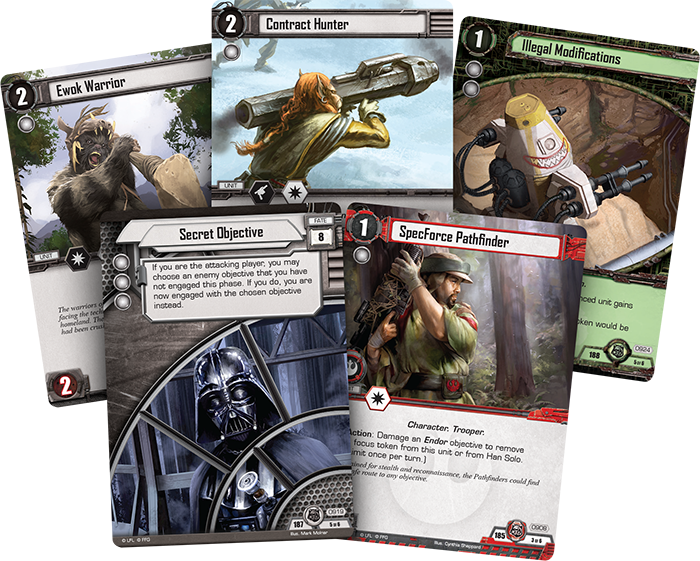 Solo’s Command and the other packs of the Endor cycle introduce a new card type to the game – mission cards. 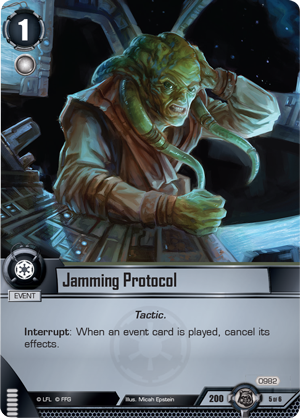 Mission cards are shuffled into your command deck at the beginning of the game, but during your deployment, you can pay their deployment cost to play them as objectives under your opponent’s control. 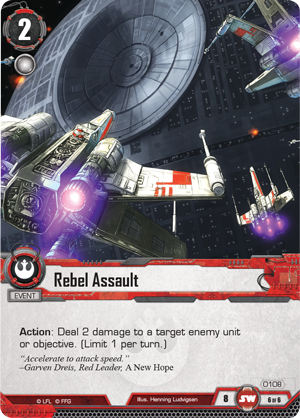 You can attack these mission cards like any other objective and use cards like Target of Opportunity (Draw Their Fire, 170) or Rebel Assault (Core Set, 108) to damage them. 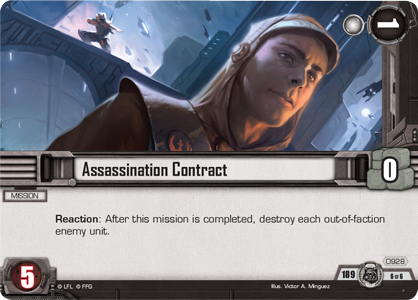 Assassination Contract is an example of a mission card, played as an objective under your opponent’s control. These missions are under your opponent’s control, but they won’t be doing much to help him. Missions count as destroyed objectives when you destroy them and they offer powerful benefits as soon as they’re destroyed. For example, you may pay a resource to put Assassination Contract (Solo’s Command, 928) into play under the light side’s control. 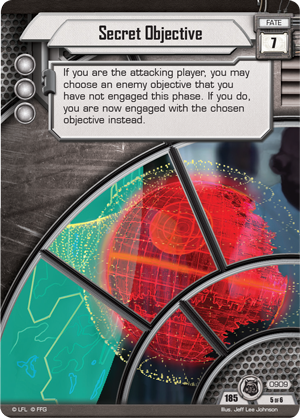 Once you successfully destroy Assassination Contract, you’ll advance the Death Star dial accordingly and per the mission’s Reaction, you’ll also destroy each enemy unit that doesn’t match its controller’s affiliation card. 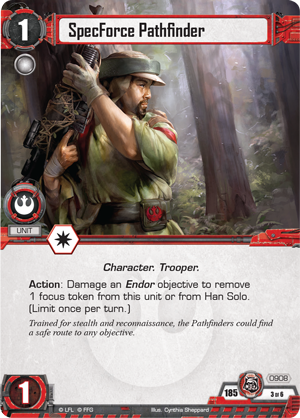 Over the course of the Endor cycle, both sides will receive new missions, including the mission that brings General Solo and his strike team to the surface of Endor in Solo’s Command. Under the leadership of Han Solo, a team of elite Rebel commandos with Luke Skywalker and Leia Organa descend to the forest moon of Endor to destroy the ground-based shield generator that protects the Empire’s Death Star. In Solo’s Command, you can lead this powerful strike team on missions against enemy objectives. The objective set begins with Shield Generator Assault (Solo’s Command, 906), an objective that allows you to turn your opponent’s attacks back against him. After your turn begins, you may trigger Shield Generator Assault to move a damage from one Endor objective to any other Endor objective. 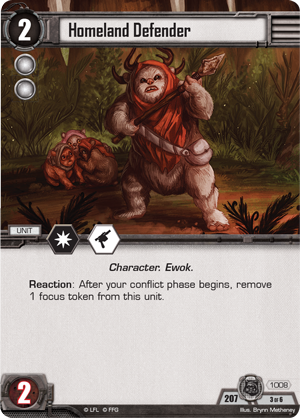 Best of all, this ability has no restrictions on targeted players, which means you can move damage from your own Endor objectives to your opponent’s Endor objectives. Alternatively, you may move damage from one of your opponent’s objectives to push another objective closer to destruction, or spread damage among your own objectives to make them harder to destroy. 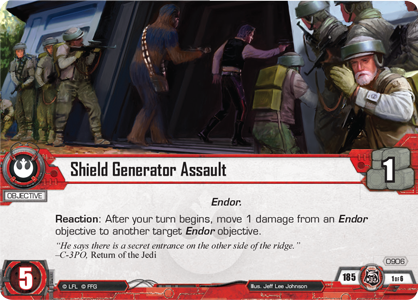 Even if your opponent has no Endor objectives in his deck, you can ensure that you have a target for Shield Generator Assault by playing Ground Support (Solo’s Command, 910) as an Endor objective under your opponent’s control. 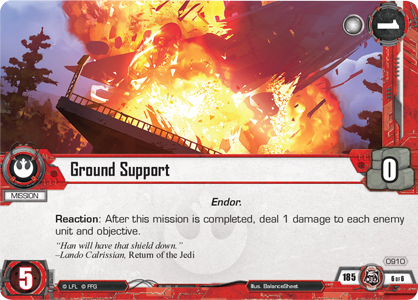 Ground Support is one of the new mission cards introduced in the Endor cycle and destroying it counts as destroying one of the three objectives you must destroy to win the game. What’s more, after you complete the Ground Support mission, you can deal one damage to every enemy unit and objective, potentially destroying multiple units and making future attacks easier. With the Endor shield generator and other crucial emplacements under Rebel attack, the dark side will naturally want to use most of its strength to defend the most dangerous attacks. But you can use the wiles of Han Solo (Solo’s Command, 907) to ensure that any attack must be adequately defended. Han Solo is a dangerous combatant on his own, boasting powerful combat icons and the elite keyword, but his most dangerous ability is his Reaction. After Han Solo is focused to strike as an attacker, you can choose another enemy objective and immediately engage that objective instead! The applications of this ability are nearly limitless – it forces your opponent to defend every engagement as if it were declared against his most vulnerable objective. 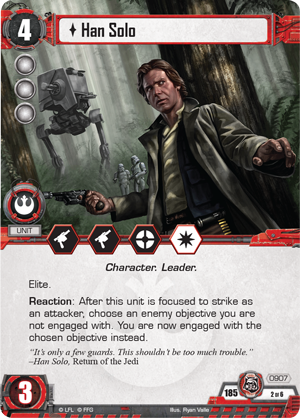 You may even use Han Solo to engage an objective that you’ve already attacked, essentially giving you two attacks against one objective in a single conflict phase. Under normal circumstances, you’ll only be able to use Han Solo once per conflict phase, because he’ll be focused once he strikes against an objective. You can use Han Solo’s powerful ability even more with the aid of the two SpecForce Pathfinders (Solo’s Command, 908) included in this objective set. These units allow you to damage one of your Endor objectives to remove a focus token from the SpecForce Pathfinder or Han Solo, effectively giving Han more opportunities to run rings around the forces of the dark side. Damaging your Endor objectives even gives you more fuel for Shield Generator Assault! 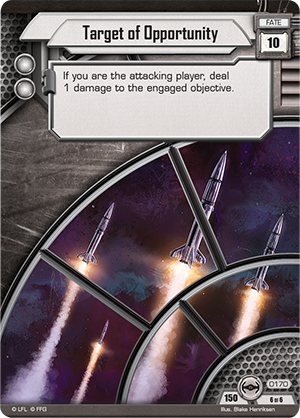 You won’t always have Han Solo to spearhead your assaults, but you can still change plans on the fly with a new fate card: Secret Objective (Solo’s Command, 909). 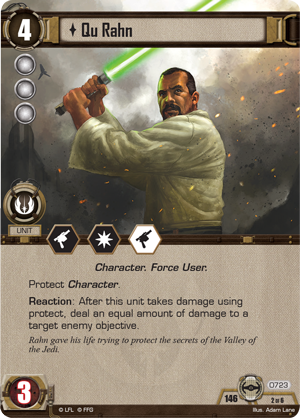 Secret Objective is one of three new fate cards introduced in the Endor cycle, and it offers a potent ability to your attackers. When Secret Objective resolves, you may choose any enemy objective that you haven’t yet engaged this phase and become engaged with that objective instead of your current target! Since Secret Objective also contributes three Force icons to your edge total, you’ll even have a good chance of having the edge as you attack your true target. 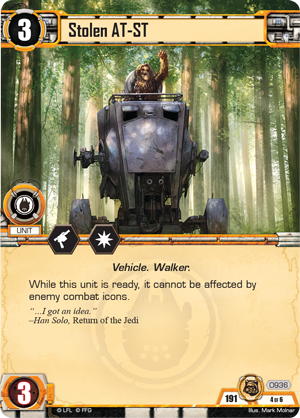 As the Endor cycle moves through the events of Return of the Jedi, every affiliation receives powerful new cards. 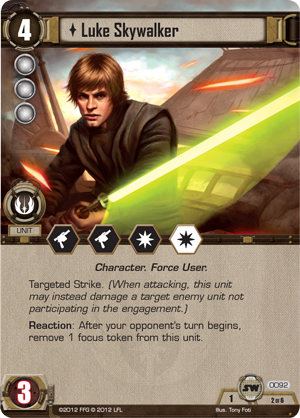 Three new fate cards add new tension to every edge battle and neutral affiliation objective sets return for both the dark side and the light side. Alongside the new version of Han Solo shown above, you’ll find new versions of iconic characters and vehicles like Executor, Home One, Lobot, Admiral Ackbar, and Emperor Palpatine. In addition to these new and powerful characters, you’ll find plenty of other cards to lead you through the climax of Return of the Jedi. You may take a Stolen AT-ST and use it to attack your opponent’s objectives, or you may initiate a Jamming Protocol to cancel enemy events. You can fight with the Ewoks and the Homeland Defender , or promote one of your Scum and Villainy units to become Head of Security . 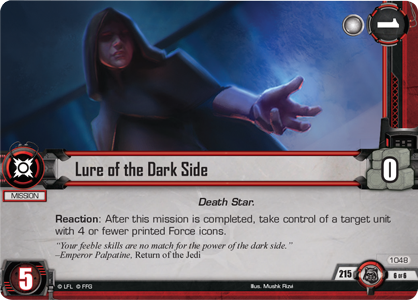 You may even tempt your foes with the Lure of the Dark Side and take control of a powerful unit like Luke Skywalker (Core Set, 92) or Qu Rahn (Draw Their Fire, 723)! Journey to the surface of the forest moon and prepare to relive some of the most iconic sequences of Star Wars. From the battle between Ewoks and troopers on the forest floor, to the massive fleets clashing around the second Death Star, to Luke Skywalker confronting his destiny in the Emperor’s throne room, you can reenter the Star Wars saga with Solo’s Command and the other Force Packs of the Endor cycle. Look for Solo’s Command at your local retailer in the fourth quarter of 2015!